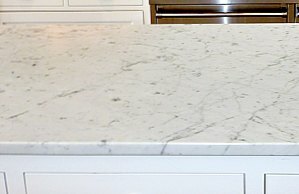 I have just had my honed white Carrara marble kitchen countertop sealed. Is there any product I can use to give a little shine....olive oil? Thanks. Yes, you can improve or enhance the shine on a honed marble countertop. Color-enhancing sealers can be applied to honed Carrara marble (or any honed stone) that will darken the color and add a bit of "sheen"... that is a low-luster gloss like when wet, but not shiny. However, color enhancers need to be applied before applying an impregnating sealer, so this option is out in your case. You could put olive oil on it, but likely won't be satisfied with the results. Since you've already applied a marble sealer the oil will sit on the surface makeing it slick and attracting dirt and grime. Eventually the oil will absorb and darken/stain (unevenly probably) the marble. Yes... even when sealed, if a substance is left on carrera marble long enough and doesn't evaporate (like oil) it could still stain. Sealing marble drastically reduces the rate of absorption, but does not absolutely prevent absorption. This is a common misunderstanding about stone sealers. Attempting to apply a color-enhancer at this point would also likely be a fruitless endeavor. Again, a color-enhancer must applied prior to your standard impregnating sealer, so at this point it wouldn't absorb properly and would look splotchy. The one thing you can do to add a bit of shine is to use the Topical Conditioner/Shine Enhancer. made for use on "polished" stone to make the shiny polished surface really pop. It won't make a honed marble shiny, but it will improve the luster some. The last option to make a honed marble shiny is to hire a marble repair and restoration professional to finish the surface to a polished finish. Then it will be very shiny! Before you do this though remember that marble etching occurs from contact with acidic foods and drinks and a shiny, polished marble will show etch marks much more readily than a honed surface. This can be a real pain on a kitchen countertop, since it is impossible to prevent etching in the kitchen... just too many acidic substances. If it's a bathroom countertop, then no worries. Etching can be rather easily repaired on either a honed or polished marble countertop, however, a honed surface won't drive you as nuts with this problem. And to clear up the mystery about how to polish marble and make it shiny... well, the high-gloss shine doesn't come from a bottle or product. I know this is confusing since many stone care products are labeled "polish", but it's not the case. Creating a shiny surface (... a "polished" finish) is a mechanical process done at the factory or post-installation by a highly-skilled professional. The best you can do is enhance what already exists as described above. Truthfully, I recommend you leave it honed, use the Topical Shine Enhancer product if you like, seal it when needed and love the Carrara marble as is. Most likely it's a build up of soap scum. Use SCP-Pristine Soap Film Remover to clean.